The point of biography is to tell the story of a life and - if possible - to tell you why that life in particular was significant. 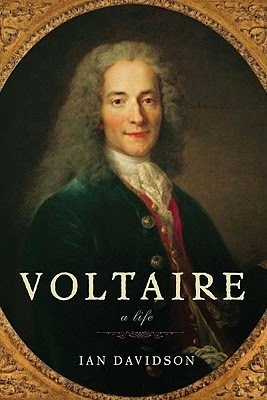 Ian Davidson's Voltaire: A Life does an excellent job of the first but at best a middling job of the second. To be fair, he is clear in his intentions. He hasn't set out to write a literary or philosophical biography - the clue is in the title. And it's an easy read of a busy and varied career. But why do we keep returning to Voltaire nearly three centuries later? It's for what has lasted those long years - works like his English Letters and Candide, his campaigns against the ancien regime's inept, brutal and theocratic criminal justice system, as well as his symbolic value as a rallying point for rationality. Davidson may give us Voltaire the man, but does not provide enough context and backdrop to render his real contributions to the world at all meaningful to the reader. Instead, he pays too much attention to his financial and domestic activities, the day-to-day minutiae all too available from so prolific a correspondent (20,000 letters over his lifetime). All of which would be fine, if a social history of Voltaire and his life was what was most needed. But, in an age where Enlightenment values are under attack as never before, as Davidson himself notes - there has never been a better time to return to and examine their legacy. In his attacks on miscarriages of justice, Voltaire mocks the idea that one eighth of a proof, times eight, adds up to a proof. Davidson's biography effectively has the same flaw - the assumption that a wealth of factual information about his subject will give you a sense of the whole. It's a necessary beginning in the search for significance - of course. But only a beginning.